Whether you want to deliver an informative talk, provide training or discuss the benefits of a product or service, it’s best to conduct a webinar to get your message across. The reason is that it’s a cost-effective method and it allows you to connect with a whole bunch of people no matter where they are in the world. This practice will allow you to reduce your travelling expenses significantly, because you will be able to share your wisdom with interested people without even leaving your home. Your webinar will not become successful automatically. You will have to make it successful by preventing all sorts of technical problems from occurring. If there are any technical glitches before or during the webinar, then they will certainly annoy your audience. To prevent anything bad from happening, I have created a simple 5-step system that will allow you to make your webinar a huge success. First of all, you must decide whether a webinar will be appropriate for your particular needs. For example, if you want to provide training to employees who work with you, then it will not be feasible to have a webinar. A meeting will be a better option. However, if you have many offices in different cities or countries, then you should certainly have a webinar to connect with appropriate employees for training. You must recruit someone to assist you with this project. You can hire your best friend, your brother or a coworker. Your assistant will be responsible for helping your attendees by answering their questions and resolving their problems. If you want several speakers to come and share their knowledge, then you must get in touch with them and confirm whether they will be available or not. You don’t want to tell your audience during the webinar that a certain expert couldn’t come to speak. That speaker might be the favorite speaker of some of your attendees. They will get irritated to hear that. So, get a 100% confirmation from your speakers. Write down everything that you want to say or share in your webinar. Never trust your memory. Always rely on your notes. 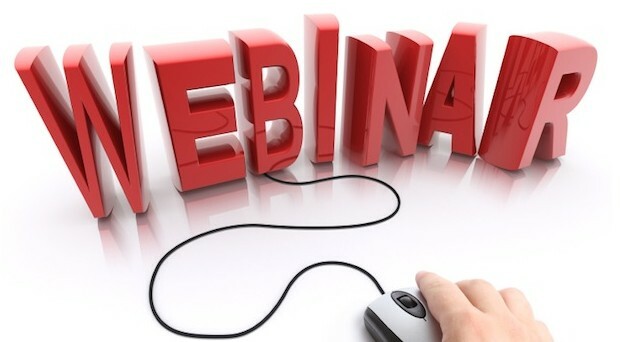 You will have to setup your webinar.Here are some of the options you have: GoToWebinar, Adobe Connect and WebEx. If you have any other company in mind, then feel free to get in touch with them. Make sure you thoroughly test it in terms of voice, recording, etc. a few days before the webinar. You need people to attend your webinar, but they can’t attend it if they don’t know about it. So, the next step is to start promoting your webinar as intensely as possible. You can write a blog post or article about your upcoming online event. There are several ways to distribute this information such as: Press Release, Facebook Ads, Google Ads, LinkedIn Connections and Social Networks. You can even create a video and share it on YouTube. Have the speakers of your webinar do the same thing to promote the event as much as possible. Before you start promoting, you need to create a page on your website or blog that will allow your attendees to register. For registration, you should get this information from your attendees: Name, Email Address and Company. Test your PC or laptop to ensure that it’s working properly. Turn off all sorts of notifications that might cause distraction during your presentation. Log in to the application that you have acquired for your webinar and see if everything is OK. Remove every distraction such as cell phone, pets, little kids, etc. to ensure that you deliver your presentation in a professional manner. Make sure you have your presentation and notes ready. If you plan to use PowerPoint, then fire it up and check the slides that you have created. After you check everything, be prepared to log in to the webinar at least 15 minutes before it begins. This practice will allow you to welcome the visitors who come early. It’s imperative that you start your webinar on time. You don’t want to annoy your attendees even before the webinar begins. When you start, ask them if they can hear you clearly. Introduce the speakers and tell them how much time each speaker will have. If there will Questions and Answers at the end, then it’s best to tell your attendees right in the beginning. Don’t forget to record your webinar. Even if you don’t plan to sell it, record it and share it for viral marketing. During your presentation, try to move slowly. If you are too quick, then your attendees with low-speed connections will have trouble following you, because at times there is up to a 5 second lag time, i.e. what’s visible on your screen will appear on your attendees’ screens a bit late. So, be cautious and don’t move too quickly. After you finish the webinar, ask the attendees to provide their feedback. This practice will be beneficial for you, because you will be able to use their feedback as testimonials and you will also learn how you can improve and deliver a better webinar next time. No matter how hard you try to avoid technical or other problems, something might go wrong. Don’t lose your mind if something bad happens. Deal with the problem in a nice manner and show your audience that you are fully capable of recovering from problems. Be confident and have faith in yourself, and everything will turn out to be excellent. Sara Brown is a keen writer with having a profession as a teacher. She has a fabulous skill set for writing in various different niches like education, travel, lifestyle, career and tech. She is currently working as an academic consultant for Dissertation Writing Service organization favoring students to find ease and peace of mind with better results.